Outside of the racial turmoil that still embroils South Africa in Clint Eastwood's Invictus stand Madiba, one-time South African activist and former president of that country, Nelson Mandela (Morgan Freeman); and Francois Pienaar (Matt Damon), captain of the South African Springboks, the national rugby union team that won the World Cup in 1995—kindred spirits in their respect for the power of sports to unite people of all colors, creeds, and social classes. The politics and personalities that Eastwood (Gran Torino) introduces in the first third of the film, the details of life in post-apartheid South Africa that populate its second third, all seem to revolve around Mandela at first. But Eastwood, whose attempts at structural unconventionality often backfire as his movies wrap up in the last third, creates a satisfying sports film by using the preceding details to set-up an emotional release in a climactic rugby sequence led by Damon's Pienaar. Invictus begins with Mandela taking office, all too conscious of residual racism on both sides of the South African divide even as he seems to blithely pursue his goal of racial harmony. He sees the strife even within his own staff, Eastwood illustrating it a little too earnestly in the internal discord between Madiba's black and white bodyguards (their chief played with scene-stealing charisma by Tony Kgoroge—who nearly reframes the film's cast hierarchy as a third lead). Springbok captain Pienaar sees the effects of Mandela's changes played out in his own home, where his father has little hesitation in criticizing the disappearance of apartheid in front of the family's black servant. And he is all too aware of the disdain the blacks have for the Springbok team and their colors, remnants of South Africa's former white dominance. They openly deride the team at their rugby tournaments. But Pienaar knows that Chester Williams (McNeil Hendricks) the team's only black player is accepted by his teammates without reluctance. So he knows the potential for reconciliation exists and understands why Mandela meets with him, inspires him to push his teammates to their maximum as South Africa hosts the 1995 World Cup. And it is here, where Eastwood's (nearly too) straightforward style and the grand nobility of the movie's themes collide giving us a powerful release in the third act's climactic rugby game. The game sequence is where Eastwood closes the circle on all the dramatic tension he has been setting up. Madiba's bodyguards finally seem to be working together well enough to be attuned to their chief's concern that the rugby match is the perfect place for an assassination attempt. A black child that the film has been following for some time—too poor to get into the game—loiters near the stadium's police presence to listen to the match as it plays out over the radio. Pienaar rallies his players to withstand the expected rout by New Zealand's All-Blacks (in a film full of nice moments, Eastwood uses one to include the All-Blacks' traditional Maori war dance used to intimidate opponents before international matches). He then pays off what little knowledge the viewer has accumulated about the confounding game of rugby to unfurl a sports sequence—strike that—an action sequence that is never once confusing; devoid of the close-up quick cutting that usually leaves today's audiences unsure of what just happened. One never loses the grip on the stadium or playing field's geography as Eastwood follows up on all the parallel plot developments. Meanwhile, Mandela presides over the game from his private box, a messianic presence not unlike Freeman's portrayal of God in Bruce Almighty. Many are mistaking Eastwood's Invictus to be a sort of biopic, a look at a critical moment in the life of Madiba. It's no wonder considering the scenery-chewing perfomance by Freeman, who acts like he took Mandela's assertion that only he could play the leader a little too seriously. Freeman's performance is writ so large on the screen, that it almost eclipses the key central development on which the film hinges. The only time one gets a true sense of the man behind the public persona is when Pienaar visits Mandela's prison cell at Robben Island, where he spent a good deal of his sentence after he was arrested for his activism. Damon really sells the impact of Mandela's movement on his generation of Afrikaners. The deference he exudes in Freeman's presence gives way to a stirring cocktail of regret, contempt, guilt, and respect in the scene where Pienaar stretches his arms across the length and breadth of the tiny cell measuring the small space while acknowledging the grandeur of the spirit that resided within its walls. 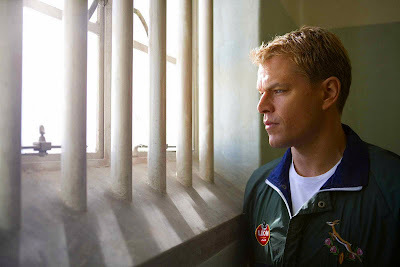 No, the performance at the center of Invictus is actually a quiet but visceral one by Damon as Pienaar. Pienaar is, after all, the character most affected by the changes in South Africa after Mandela helps bring an end to apartheid and ascends to the presidency. Within the story, Mandela is simply the agent of change that advances the story. So those maligning Invictus for its simplistic depiction of Madiba are failing to comprehend why this film works. At its heart, this sports drama is inspired by Mandela rather than about him. Great review. I think this movie caught a few people off guard as they believed they were getting a Mandela biopic instead of getting a rugby film. I like what you say about the different stages of the film. I quite honestly didn't realize that the final 30+ minuets was going to be the rugby match. You're right that a lot of the pent-up racial frustrations are released in those final game moments, but I also felt like the beats were all too familiar, and really aside from the stunning crowd shots and the logistics of the stadium (you're right about the viewer never really feeling lost throughout the match) I just kind of felt like it was old hat after a while. I loved Damon's performance, though, and I think the first hour of the film is enough to recommend it, but I just think that it went on a tad too long. I know nothing about rugby, so I guess I should be grateful for an extended sequence in which I can see (kind of) what the sport is generally about; however, after ten minutes or so I started to get antsy as I was waiting for the inevitable. That final moment, with the national anthem being heard around the country, is a powerful one, though, and kudos to the actors for elevating the material...something you almost always have to rely on when dealing with a sports film. Great stuff here as always, Tony. Thanks for the comment, Mad Hatter. I agree. Kevin, I read your review, so I know you were unimpressed. And I don't think this is on the level of some of Eastwood's best (or even best films this year) by any stretch. But I do think it has some solid new things to say about race relations (even if Eastwood tries to couch it a little to precisely through the prism of Obama, a detail I purposely left out of the review because it is so obvious in the film), and how it applies to the way we view sports. I don't think it's as much "old hat" as a throwback to a classical style of filmmaking that addresses some of the same themes of male bonding as Hawks used to in his filmography. Along with last year's Ford-like GRAN TORINO, I applaud Eastwood's turn to the classic style and away from some of his generally unsuccessful story structure experiments. Happy Belated Birthday to Cinema Viewfinder!